Court Orders Arrest Of Wizkid For Conning Ugandans! Like street man can say, WizKid is in sh*t. Nigerian singer could anytime be attrested for being a crook. Well, following the cancellation of most of his end of the year show, which saw Wizkid apologizing to all his Ugandan fans , Buganda Road Chief Magistrates court has issued arrest warrant for Nigerian Musician, Ayodeji Ibrahim Balogun aka Wiz Kid. The singer is accused of obtaining money by false pretense, cheating and, conspiracy to defraud, designed by Face TV lawyers of Muwema Co. Advocates and Solicitors. 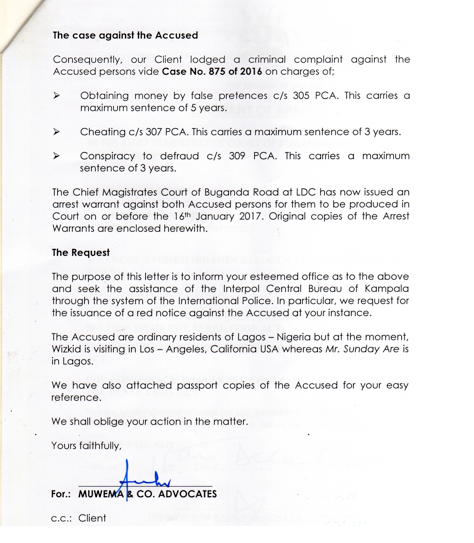 According to document seen, the filed affidavits by Face TV lawyers of Muwema Co. Advocates and Solicitors, revealed that between August 29th and November 29th 2016, Face TV paid a total performance fee of USD60,000, a brokerage fee of USD5,000 and USD3,000 to Sunday Are, Wizkid’s manager. This was for the days they were to spend in Uganda. Upon accepting the deal, the organizers is said to have incurred substantial expenses in bookings and re-bookings of flights, hotel, venue, advertisements and promotions for the concert which amounted to a whooping USD300, 000. while over 25,000 people were said to have also purchased their tickets in anticipation of the concert. 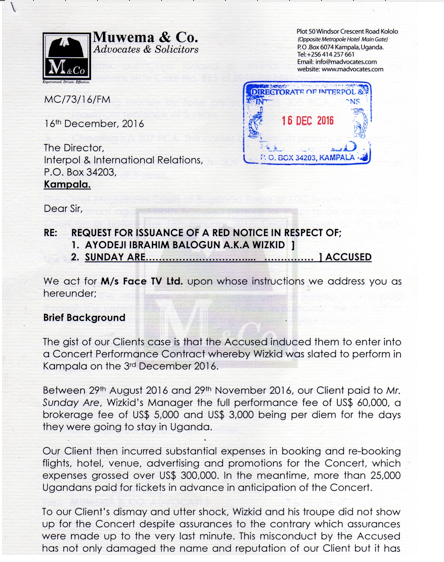 Wizkid, was billed to perform on December 3rd, at Lugogo Cricket Oval in Kampala, but did not show up. The Magistrate has now ordered police to produce Wizkid and his manager in the Kampala Court before or on January 16th 2017. On all counts, the pair faces three years jail term each.